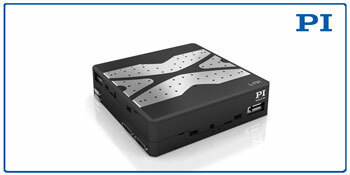 (Nanowerk News) Motion and precision positioning systems expert PI (Physik Instrumente) L.P. introduces a new compact metrology XY stage – the L-731. The magnetic linear direct drive ensures high velocity and acceleration, ideal for inspection and microscopy. With a travel range of 205mm square and solid velocity to 100mm/sec, the L-731 delivers high accuracy and smooth motion. Precision crossed roller bearings with anti-creep cage assist guarantee superior guiding accuracy (1.5µm straightness for loads up to 20kg). An integrated optical reference encoder and limit switch provide further positioning control and accuracy for this compact stage with 5nm resolution. DC servo motor versions are available on request. Things are becoming more and more nano: The latest precision motion and alignment technologies explained by PI's Scott Jordan ant the 2016 Photonics West conference in San Francisco. Silicon Photonics Alignment Systems, Piezo Motors, Air Bearings, Piezo Flexure Nanopositioners and more. Fields of applications include automation, semiconductor applications, photonics, bio-nano-technology, metrology, microscopy, micro-manipulation, including cleanroom applications. PI is a leading manufacturer of precision motion control equipment, piezo motors, air bearing stages and hexapod parallel-kinematics for semiconductor applications, photonics, bio-nano-technology and medical engineering. PI has been developing and manufacturing standard & custom precision products with piezoceramic and electromagnetic drives for 4 decades. The company has been ISO 9001 certified since 1994 and provides innovative, high-quality solutions for OEM and research. PI is present worldwide with eleven subsidiaries, R&D / engineering on 3 continents and total staff of 800+.